The definitive anthology. Movies, anecdotes, curiosities, stories, scripts and interviews of the legendary film director. 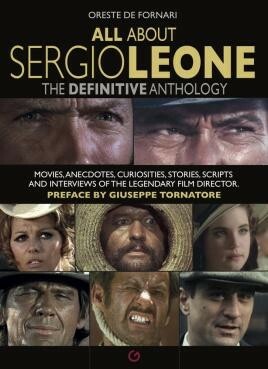 The definitive anthology by De Fornari uses individual films, along with original material: a preface by filmaker Giuseppe Tornatore, a collection of quotes arranged alphabetically and an essay (Six Ways Not to Resemble John Ford) that explains what distinguishes Leone from the myriad of Italian and American directors making westerns. This is the first volume of a new series ("All about...Cinema!) dedicated to the most American of Italian directors, a master who will celebrate a double anniversary in 2019: 90 years since his birth (3 January) and 30 years since his death (30 April). A definitive anthology dedicated to the most American of the Italian directors, who's way of doing cinema has influenced tens of filmakers (Tarantino above all). The book provides a detailed examination of films, personal memories of the director and of the many collaborators who worked with him (from Bertolucci to Dario Argento, from Ennio Morricone to Clint Eastwood), script excerpts and beautiful photographs. The volume - written by De Fornari, an experienced Italian film critic (who knew Leone pretty well) and author of another insightful book about Leone - also includes a preface by filmaker Giuseppe Tornatore (Academy Award winner), a collection of quotes arranged alphabetically and an essay (Six Ways Not to Resemble John Ford) that explains what distinguishes Leone from the myriad of Italian and American Western movies directors.